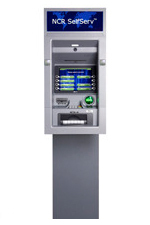 The NCR SelfServ 36™ is an outside ATM that offers intelligent cash deposit and/or recycling and a range of revenue generating services. Its very compact footprint and slimline user interface make it ideal for vestibule or outdoor locations where space is at a premium. DEPOSIT: Intelligent Cash Deposit and Recycling.